Gayle Whitehead - owner of Santa Cruz's Body Resultz - bio and gratitude statement. Growing up in Lake Tahoe can definitely develop personal passions early in your life. With a gorgeous backdrop like Tahoe comes a real eye for esthetics on all levels. Gayle didn’t miss any opportunities offered at Tahoe…..she was athletic (snow skiing, water skiing, horseback riding, biking, hiking, diving, etc.) with a keen eye for stage and theatre as she was exposed to Stateline Nevada. She finds it very embarrassing…..but, Gayle was Miss Lake Tahoe (hey, the prizes were season tickets at Heavenly, trip to hollywood film sets & thousands of dollars of ski clothes & equipment) at the same time she was working at “Elaine’s Stateline Beauty Salon”. This was a large 14 station salon where she worked her high school years to save money for attending University of Nevada. She got a little bored at the shampoo bowl as she looked out the back door where limousines would occasionally pull up with showgirls or celebrities from the casinos to have their private entrance to the Skin Care Room. This was the location for the well seasoned, renowned german esthetician “Olga” to perform her famous “European Facials” professional makeup, and showgirl waxes (currently known as Brazilian Bikini Wax). Olga trained Gayle on all levels of Skin Care. In addition to occupational education and both State Board Licenses that Gayle has attained, the most valuable experience she has ever received came from Olga. The true skin evaluations, techniques and fabulous massage “secret moves” come from the european experts like Olga. She was the first to nickname Gayle the “Wax Queen”. Showgirl after showgirl agreed this was a well-deserved title and called her the same. It all started when Gayle was 17. Gayle built the first Personal Training and Skin Care Facility Combination in Santa Cruz County (she was also the first female Certified Personal Trainer). Her gym was 1,100 sq ft with over 6,000 pounds of equipment. Her adjoining Skin Care Room was approximately 300 sq ft with all state-of-the-art European top quality (Silhouette Tone) skin care equipment to include the Bio-Therapeutic E2000 Facial Toning machine. The name Gayle gave to her facility (1989) was simply “BODY RESULTZ”….she was thrilled and so were her clients. Due to some sports related accidents, Gayle can no longer do Personal Training. Still, it is part of her strong foundation of excellence in Skin Care. Your skin (as the largest organ of the body) will truly reflect just how healthy your body is from the right foods, fluids & exercise. So, if you come to Gayle for Skin Care, plan on receiving an education of the “full circle of excellent skin care”. Gayle’s career in Skin Care has covered just about every level offered. After over 25 years as a Licensed Clinical Esthetician, Gayle spent a total of 8 ½ years in the medical profession (almost 4 years with Plastic Surgeon Dr. Fred Tomlinson) and the remaining years in Dermatologist’s offices (to include Sun Valley, Idaho). Now she sees all the benefits from Clinical to Organic Skincare and offers services and products to appeal to all types of clients. In June of 2006 Gayle opened her own private Skin Care facility “Body Resultz Skin Care” at 1001 Center Street, Suite 3 in downtown Santa Cruz. It is inside the Santa Cruz Art Center and she calls it her little “Jewel”. It has a clean contemporary feel for both sexes and all ages offering all levels of skin care needs – clinical to organic…..healthy makeup-sheer to dramatic. You’ll find the product lines she carries to be the “best” she can recommend after her more than 25 years of making sure she’s providing “affordable quality products and services”. Gayle’s personalized treatments include a “personal calendar” she designs for you to review with her at the end of your session and take home to put to good use. She is available for a 20 minute complimentary skin care consultation by advance appointment. I feel very grateful at this point in my career. So happy to have completed my beautiful new facility, everyday I think of people who have influenced and trained me through the years. Obviously, I am grateful to “Olga” for getting me started. I still use so many of her techniques to this day. I’m thankful to David Ferrari who taught me to “let the phones ring and take care of the customer standing in front of you”….and all the other common sense courtesy we all should provide to customers, plus his acute sense of business. I am truly forever influenced by Dr. Fred Tomlinson who patiently taught me anything and everything I know about Medical skincare and mostly I thank him for trusting me with pre & post op care with his wonderful patients. A big thank you to Moises Estrada who helped put the FUN into skincare the second time around for me. 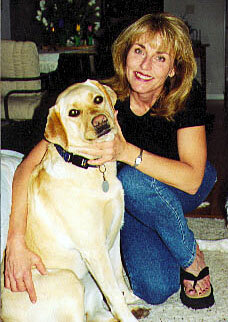 I’m grateful to BellaSophia, my Yellow Lab who is always glad to see me come home from work even if I’m 3 hours later than usual. And, last but certainly not the least, the biggest THANK YOU I could ever say would be to my clients through ALL the years who make me feel appreciated and needed and even make me part of their lives through weddings, acne corrections, age defying experiences. And for them “marching along like good little soldiers” with the personalized calendars I design for them to receive compliments to them like “what are you doing to your skin?”….and they can answer, I’m doing what Gayle suggested!